While out for a walk on my lunch break I stepped in to the local book store to peruse the bicycling magazines. 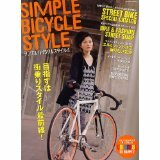 Who did I find staring back at me from page 18 of "SIMPLE BICYCLE STYLE 4", none other than Señor Crankee himself posing with his custom designed ShiskaBike. Remember Crankee is currently cycling over the Southern Alps of Japan raising money for Hope International and that its not too late to donate to his cause.